ELinks is an advanced and well-established feature-rich text mode web (HTTP/FTP/..) browser. ELinks can render both frames and tables, is highly customizable and can be extended via Lua or Guile scripts. It is quite portable and runs on a variety of platforms. ELinks is an Open Source project covered by the GNU General Public License. 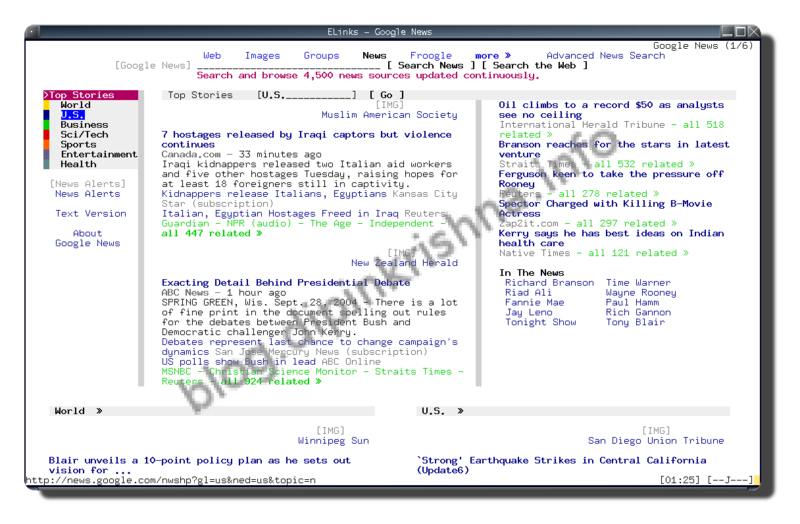 ELinks is a program for browsing the web in text mode. The goal of the project has from the beginning been to provide a feature-rich text mode browser with an open patches/features inclusion policy and active development. One of these features is that ELinks includes Links-Lua which adds scripting capabilities to ELinks. And if you think that the current web is unbrowsable without images, you are wrong. 75% of the actual sites you visit are perfectly browsable (especially with the tables support) and another 15% are not exactly pleasant but still well-viewable. And even in text browser you can easily view individual images through some external viewer (like zgv on Linux console). Some people are actually using ELinks as their exclusive browser. However, you obviously do not need to be so extreme to still have many good practical uses for a text browser. ELinks was forked from the original Links browser written by Mikulas Patocka. It is in no way associated with Twibright Labs and their Links version. Below the most noteworthy features are listed.